We collects several types of information regarding our Guest User and Register Users: We collects personally identifiable information from our users. The personal information collected by us mainly consists of Contact Details (i.e. Email Address, Contact Number), Personal Details (i.e. User Name), Billing Details (i.e. Physical Billing address, Payment Method, Transaction Details), User Preferences (i.e. Preferences of order method, Time-zone, Language), User Comments (i.e. Feedback, Complain). We collect information so that you can place order, request information and support and make product suggestions. Our website and mobile application use forms to collects information. We receive and store your information you enter on our website or mobile applications, five us any other way like email, telephone or other communications with our customer service team. If you contact us for support, we will keep an internal records for that also. We used to communicate with you through emails, messages or call. We use emails to confirm orders placed by you or to send information requested by you. We are also providing email links to contact us directly. We are eager to reply you for your message. The information which you have send to us may be reviewed, discarded or used. These information may be used to improve our Website, Application, Product and Services. To process your order we may send your information to credit reference and fraud prevention agencies. A cookie is a piece of data stored on a site visitor’s hard drive to help us improve your access to our site and identify repeat visitors to our site. Cookies can also help customize the site for visitors. Personal information cannot be collected via cookies and other tracking technology, however, if you previously provided personally identifiable information, cookies may be tied to such information. We are not storing any cookies to browser by code, its browsers feature to store cookies by clicking on save password. We believe the security of your information is a serious issue and we are committed to protecting the information we receive from you. We take precautions to protect your information. We use security measures to protect against the loss, misuse or alteration of the information under our control. When you submit sensitive information via website or application, your information is protected both online and offline. Whenever you enter sensitive information on our forms, the information is encrypted using MD5 and transmitted to us in a secure way. While we use encryption to protect your sensitive information transmitted online, we also protect your information offline. The computers/servers in which we store personally identifiable information are kept in a secure environment. We will retain personal information only as long as our business needs require. We will then destroy or render unreadable any such information upon disposal. However, we do not guarantee that unauthorized access will never occur. Users who have registered to the site agree to keep their password in strict confidence and not disclose such password to any third party. We may share information about you to third parties to provide various services on our behalf to fulfil your request (i.e. to ship your order, to process credit card payments, serving advertisements, conducting surveys, Customer relationship managements, performing analysis of our service). We will only share information about you that is necessary for third party to provide the requested service. These third parties are prohibited from retaining, sharing, storing or using your personally identifiable information for any other purpose. This policy does not apply to information that you provide to any third party such as restaurants at which you make reservation and/or pay through our services and social network that you use in connection with our services. “FoodChow Restaurant Manager” app is available to all restaurants owner. 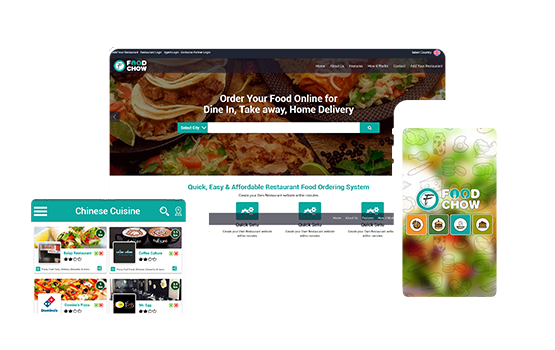 Restaurant owner can use this app to manage restaurant details, manage orders, setting up all menus, handling payment, delivery method and so many other features. We provide feature of Restaurant Photos where restaurant owner can upload photo for their menu,food and ambience. We are using Instagram API to allow restaurant owner to login into his Instagram account and upload his Instagram photos for menu,food and ambience photos. We collect and use your information to provide feature of uploading photos using Instagram account. We do not disclose your private information to any third party apps.